Baie dankie vir jou hulp en bystand. Jy verdien ‘n ekstra ster. Jou belangstelling en diens was absoluut puik!! Vandat ek kwotasie aangevra het tot aflewering was puik hanteer. Advance kan regtig trots wees om jou in diens te hê. Dan wil ek ook net ook melding maak van die puik span wat my huisware opgepak het met soveel “smiles” vriendelikheid en behulpsaamheid. Hulle was regtig puik. Ek moet melding maak van hu name : Die bestuurder Elijah : Shaun was regtig die uitblinker en het orals vasgevat : Boyce – Hy is regte vasvatter en Phumlani. Baie dankie ek van Advance se diens kon gebruik maak. Weereens baie baie dankie JP – Jy is voorwaar ‘n aanwins vir Advance. I would like to sincerely thank you for the assistance I received from Advance Transport these last two days. The crew that was on hand; Elijah, Eric, Shaun and Phumlani were truly outstanding and very professional. In Oranjemund and in Windhoek other people who saw the Advance truck often came to them asking for boxes to assist them with their future Advance moves. I found this quite comical, especially a man in Windhoek that was following the Advance truck. They too handled these peoples queries with respect. Nothing was ever too much for them. Ms Ike Bertels Film company from the Netherlands is also in Oranjemund. She comes and goes every few months to film the transformation of town over the last few years. She will be premiering her documentary in December 2019 in Amsterdam ‘A Paradise in the Desert’. She found the guys packing up a house a day before my place and she asked to film the guys working. They also had no problem with her around. Her purpose here was to film people leaving town and asks why the move away from Oranjemund? Then vice versa she looks for new people moving in and their reasons for moving. She let me know that she will send her link of her documentary to all her participants before it airs. I will forward the link to Advance as well when I receive it if the crew would be interested to see it. With all this said, thank you once again JP for assisting our family. I am forever grateful. I hope you have a blessed festive season with yours. Getting a bit emotional seeing all our stuff being packed ready to be shipped. Thank goodness for Advance Worldwide Removals. They have told us to go sit down and watch tv (exact words). They really have been absolutely fantastic in making this as stress free as they possibly can. If you are planning a move give them a call! Once again – thanks again to all at Advance Transport for what has been a thoroughly professional reliable and transparent process from start to finish. As a person who has been in the service business for 34 years and I can only hope that the agents in Ireland are half as efficient, careful, considerate and frankly as interested in our move as you and your very professional team have been. An international move is such a stressful process to go through and it seemed every day I have had more loose ends to tie up that were resolved but to be frank the least of the problems has been the move with you guys. It was touch and go between Advance and another company that had both been recommended on an online chat group of South Africans moving to Ireland and I settled on Advance because I got a very prompt response and confident answers to some questions I had, and your price was a little more competitive. On the actual packing and moving days, Tony was so calm and relaxed and organised – a video of him and his team in operation would be a great idea. Fantastic, exactly as agreed, thank you so much Marc. We are exceptionally happy, you guys have given us phenomenal service from the beginning, we really appreciate it and have already recommended you guys to our friends. This is just a note to say a BIG THANK YOU to you and your colleagues for a fantastic, hassle free, worry free, relocation experience. Our shipment arrived last week Friday and everything was packed really well and handled with great care. Not a single broken, scratched, chipped or cracked item! Thank you with your patience with me throughout the entire process, for answering all my questions and keeping me up to date with the progress – from our first communication in February until delivery. I really appreciate it and will most definitely highly recommend Advance Transport to anybody in need of relocation services. I had the pleasure of dealing with one of your staff members, Sonia Pereira, during my relocation from South Africa to UK. What a competent and professional lady! I found her to be knowledgable, helpful and very friendly and no request was too much effort. I feel I need to commend you guys for having such a proficient lady in your employ. While it is always very easy to complain when things do not go as planned, I find it seldom is acknowledged when a good performance takes the burden and concern out of your hands. This lady is very valuable to your company and a great brand ambassador and I would not hesitate to recommend your company to family and friends. Thank you for making this move a pleasurable one. My shipment was delivered yesterday, and I wanted to thank both of you for great service. My move back to Cape Town after 46 years in Jerusalem was not easy for me, but it certainly helped to work with professional, efficient, and pleasant people along the way. Charlotte, as I mentioned in another e-mail, the delivery team did a great job yesterday. I would like to thank both your agencies for the professionalism that you applied in making our move to Malta and easy one. Although the time it took was long it can be forgiven as the process was seamless and the teams on both ends did their utmost best when it came to handling queries, clearing, packing and unpacking. Hopefully I don’t have to move soon but I will be making use of your services when I do. I will also definitely recommend both agencies to anyone who needs to move abroad. Just returned from Europe to find your carefully stored crates in our lounge, Thank you. Crates larger than expected and look robust. Thanks again Charlotte for your efficient and professional handling of our effects in CT, and smooth Hermanus delivery. Have your business cards and will happily recommend. You were great Thank you Charlotte. I would just like to thank you and your team for once again assisting me in getting my cars to the UK. Keep up the good work. I definitely will return for more business. Ek sal hierdie company enige tyd aanbeveel. U Hulle prys was billik en die staf baie vriendelik en hulpvaardig. En JP het alles met n smile gereel. Just a word of thanks for a job well done….from the quote, to packing, collection, admin and finally delivery and unpacking. Everything has happened on time and the communication from both sides of the world has been excellent. We’re now settled in with all our belongings safely in place. Much appreciated and I’d be grateful if you’d extend our thanks to the wider teams at both ends. If anyone wants a reference for Advance or Transworld by all means use us….you guys were excellent! Thank you very much. Everything arrived immaculate and even the workers of K&N admired the top packing. I now understand that it was tremendous work to wrap all that and it is worth every cent. I’d like to tell you that although my move from Johannesburg has had to be in gradual stages – 3 in total – that I have been very fortunate to have been introduced to your Company by Mark Palmer. From the beginning of August when the first load left Johannesburg, to the last load being delivered in mid-December, you and your staff have been extremely accommodating, cheerful and helpful, with excellent communication along the way. Every care was taken to ensure that everything arrived in good order, and although there were a few things, naturally, which took a bit of strain, or broke, I found that the attitude was one of concern, and care. Even my plants were watered en-route, and I was overjoyed to receive them . I can highly recommend your company to any other family looking for great service. There is no such thing as a stress-free move, but you and your company have proved to be of invaluable help in assisting in my relocation, and shouldering the heavy load! Thank you JP. Keep up the good work in 2017. Just wanted to let you know that my freight arrived intact from Africa to UK on the 16th. Thanks for everything and I would have no hesitation in recommending Advance Worldwide Removals. Fast, efficient, friendly, helpful and most importantly careful. Apologies for long delay in getting back to you but we have only just moved back into our home and unpacked all the boxes – all in order! Sincere thanks to you and the team, both in Cape town and the UK, for the hassle-free transport and delivery of our freight. I would be pleased to recommend your services to anyone looking to send stuff to the UK and should be grateful if you would pass on my thanks to the others involved. Our goods were finally delivered today. A local firm called MQQ offloaded our boxes to our residential address and helped carry them to our door. Friendly and helpful , not to mention impeccable service i.t.o prompt responses to my queries and constant updates on ETA of goods etc. Our boxes arrived in good condition. We haven’t opened all of them as yet, however the condition of the boxes appears to match the state we last saw them in. One wouldn’t think that they’ve traveled halfway round the world from South Africa to the UK to Canada. Thanks to you and your team, as well as your suppliers for contributing to the great service we’ve experienced. It’s crazy to think that this all began with my last minute frantic call to John the day before leaving Cape Town. Advance Worldwide Transport will always be a knight in shining armor to both my wife, Alisha, and I.
I just wanted to say thank you for the way your company dealt with our shipping job back to the UK. The staff you used at both ends were efficient and reliable. I cannot believe how carefully everything was wrapped! Well done and like Marnie – I would not hesitate to recommend your company. English UNFORTUNATELY is my second language, because I need lots and lots of wonderful describing words to tell you HOW impressed we are with the services you rendered. The students’ stuff arrived on Saturday afternoon and everything is now stored in a garage before they can actually move into their new apartment. Thank you ever so much for everything. From your first quotation until today, you’ve just been so kind, helpful and most of all, affordable with your services. The truck arrived on time in Potch and even offloaded a day too early in Windhoek. Communication with the driver was excellent. The personnel handled our things with the utmost care and were just so helpful and friendly. There is no way to describe how “STRESS-LESS” this whole event transpired. I just cannot thank you enough. We wish you all the best and may your business just prosper. May you also enjoy a wonderful festive season and find time for a well deserved rest. Yesterday we took delivery of our furniture and personal effects which you so kindly handled for us. We should like express our thanks and appreciation to both of you for your help and such efficient service. The team which collected our goods in South Africa and the team who delivered in the UK were very professional, efficient and pleasant. Please convey our thanks again to both teams. We will recommend your services to any of our friends who are contemplating moving at some stage. After the container arrived and work is done we want to thank you for your very good organisation, operation, activity and task.We relocated a lot lately, but never experienced a better job than you have done. Your labours were reliable and perfect in packing, friendly and helpful in any matter. Your partner here in Austria was also ideal working, best in information and again helpful. We doubt that your company can provide us with another service, but we will recommend you to all our friends in South Africa and will tell them how perfect your company works. I’m writing to you to thank you for your services regarding our furniture removal from Knysna. The whole move was done very efficiently by your chaps who proved to be well mannered and extremely hard working. They had wrapped and packed and gone from the site all in one day. We met them the following day down in the Strand, where they unpacked for us into a little factory unit that we had quite fortuitously bought about 2 months earlier and was empty! Well done to Petrus and his team! I must compliment Heinrich and his team. They were very pleasant to have around. Heinrich always communicated with me when they were going off for lunch and how things were going and what still needed to be done. It was a very busy 3 days but they all worked extremely well. It was amazing to watch how they pack everything in to the container. This is just to thank you for the excellent service we received from you and your team. Our container goods arrived as promised on the day and all in great condition. Your team that brought the consignment to our house were fast, helpful and exceptionally polite and efficient. I will certainly be recommending Advance Transport to all my friends and family. Ek voel so sleg dat ek nog niks laat weet het nie, maar dit is ‘n woeste week en ‘n bietjie. Dit lyk darm of ons die week darm ingetrek sal wees en dat dinge soos huis gaan begin voel. Ek wil net vir jou en jou span BAIE dankie se vir die goeie werk! En ‘n spesiale DANKIE aan Henry wat uit sy pad uitgegaan het en ons ‘n paar rand gespaar het op die grens. Dan ook sy eerlikheid! Dit is ‘n absolute “asset” vir Advance om Henry aanboord te he! This is to express my most profound thanks for the excellent consideration and service you are offering me. The car had arrived today and I truly wish to thank you for everything. Ons wil net al weer baie dankie se vir jou wonderlike diens en dat jy altyd bereid is om n plan vir ons te maak. Ek weet nie of jy sal kan onthou nie maar Advance help nou al vir ons van 1998 af toe julle gehelp het om my Ma te trek van Johannesburg tot op Okahandja. Ek moet ook net se dat ons nie weet van iets wat gebreek was of weggeraak het nie oor al die jare. Ons sal altyd weer van jul gebruik maak want ons het baie vertroue in julle diens. Baie dankie en als wat mooi is vir julle. In July you moved me from Sanddrift to Milnerton. I would just like to commend your driver Elijah and porters Eric, Shawn and Johannes who went out of their way to make my move as pleasant as possible and for also taking such very good care of all my furniture and belongings. Nothing got broken or damaged and nothing went missing. I will certainly recommend you to everyone I know and will definitely use your services again in the future. Our furniture from the UK was delivered to us in Hermanus last Monday and we just wanted to thank you for delivering so promptly and for such an efficient service. The crew were great and very helpful in putting our furniture where we wanted it. I’d just like to drop you a short note to say thank you very much for your excellent service which your company provided during the time of our move to Poland. Compliments also to your team who packed our furniture and goods at the beginning of August. It was all very professionally done and nothing was broken and or damaged. Your Polish Agent was equally impressed. Service Excellence is always the best for a company like yours; it enhances its reputation and image. Many thanks again and all the very best. JP, SU HR would like to thank you for the professional services you provide to Swakop Uranium. Mr. Berthon informed me this morning that he’s very happy and satisfied with the professional services delivered to him during his relocation to Swakopmund. Looking forward to the same quality and professionalism for future business. It all went very well. Octavon, Mike and Marco were outstanding. Very professional and worked like trojans. I think it was Ben that replaced Marco on Tuesday, also very good. On Wednesday Simpiwe, Jesse and their two helpers arrived. They were equally as good. I was concerned it would not all fit in, but Simpiwe’s experience came through. John managed the entire process really well. It gives me great confort that our furniture is in good hands. We look forward to an equally pleasant experience till our furniture arrives at its final destination. I would just like to thank you for your professional service, and assisting me whenever possible. I would like to comment on the excellent and friendly service of the four men that helped us. They knew exactly what they were doing, and made the move stress free. Thanking you and the team for everything. Will definitely advise Advance Transport to anyone moving! My items arrived this morning to much excited from me, and much bemusement from my 5 year old son to his Dad’s reaction. When I asked Terri, my sister, to look into getting my personal kists and other items shipped over I hoped things would run smoothly, and I would get my items safely and in a reasonable time – you guys have been absolutely brilliant – thank you. From your excellent communication, advice, pick up procedures, packaging and delivery via customs you are a credit to your industry, you really are guys. I will recommend you without hesitation – it is not often one can experience such outstanding service (proud to be a Saffa) – it is rare that a service company actually “does what it says on the tin”. My son has built his castle with the bubble wrap now , and has claimed the crate for what makes a great outside box for his garden toys and balls etc. Sincere thanks again, very much appreciated. I just want to say thanks to Marc for all the effort and everything you did regarding the removal and for all your help making it easier for us. I appreciate it. This whole immigration process can be stressful sometimes and you really made the removal process easier for me, thank you. Jeffrey, Dankie vir alles. Oppad deur die Vrystaat. Nogmaals baie dankie vir puik diens. Julle laaiers en die bestuurder van die beste werkers in julle diens. Hulle is fantasties. I would like to thank Advance Transport for the assistance you afforded my mother-in-law with her move to Pinewood Village. As usual the the move went on without a glitch and the service was as slick and professional as we have come to expect. Ek wil net ‘n paar woorde van waardering en tevredenheid aan U rig. Julle maatskappy het ons meubels op 24 Maart vanaf die bogenoemde adres na Danabaai verhuis. Ons het in die verlede baie verhuis en van verskillende vervoer dienste gebruik gemaak, maar nooit het ons die klas diens ervaar. Hiermee wil ek graag my spesiale dank oordra aan Petrus Magaliso, Lukas Bosman, Gert Bosman en Patrick Sabela. Stiptelikheid, professionalisme, hulpvaardigheid en hoflikheid was geopenbaar deur bogenoemde lede. Die diens verrig was van ‘n bogemiddelde gehalte en hulle verdien om uitgesonder te word . Baie dankie vir julle uiters professionele diens, dit is hoog op prys gestel. 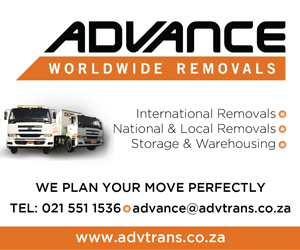 I would like to thank Advance Transport especially Johnny, Simpiwe, Eric, Octavan and Dwane for the most amazing way they packed and looked after our homely possessions. They are so honest, courteous, helpful and friendly. I will recommend Advance Transport to everyone I know. Thank you once again chaps for the amazing service you have made our life’s so early during this big transition. Mark once thank you for sending the best team to us. Advance Worldwide Removals has a reputation for efficiency and attention to detail. We plan your move perfectly. 18 Railway Road, Montague Gardens. © Copyright 2019. Advance Transport. All rights reserved.